Why doesn't my car radio work anymore? There are a few things that can cause a car radio to suddenly stop working, but it’s tough to say exactly what your problem is without knowing some more information. For instance, it could be as simple as a blown fuse if the display doesn’t come on, or it could be an antenna problem if the radio part doesn’t work but other audio sources (like CD players) do work. Here are a few different common problems and potential solutions. If you get in your car one day, and the radio won’t turn on at all, it’s probably a power or ground issue. You might want to start by checking the fuses. If you find a blown fuse, try replacing it and then driving around for a while to see if it blows again. If it does, then you have a short somewhere that’s probably going to be a little more difficult to fix. While it may be tempting to "fix" a blown fuse by using a heavier duty fuse, it's important to actually drill down, find the root of the problem, and correct it. The nature of car fuses means that you can easily replace a weak 5A fuse with a heavy duty 40A fuse, since they have the same size and shape, but doing so could destroy your wiring or even cause a fire. If you have a voltmeter or test light, you can check for power and ground at the fuse block and also at the radio itself to help locate the fault. Loose or corroded grounds will usually cause more complicated issues than a total failure, but it’s worth checking before you go out and buy a new head unit. Because if both the power and ground are good, and your head unit still won’t turn on, it’s probably toast. If you have a car radio that works sometimes, and suddenly cuts out at other times, that can be more difficult to diagnose. 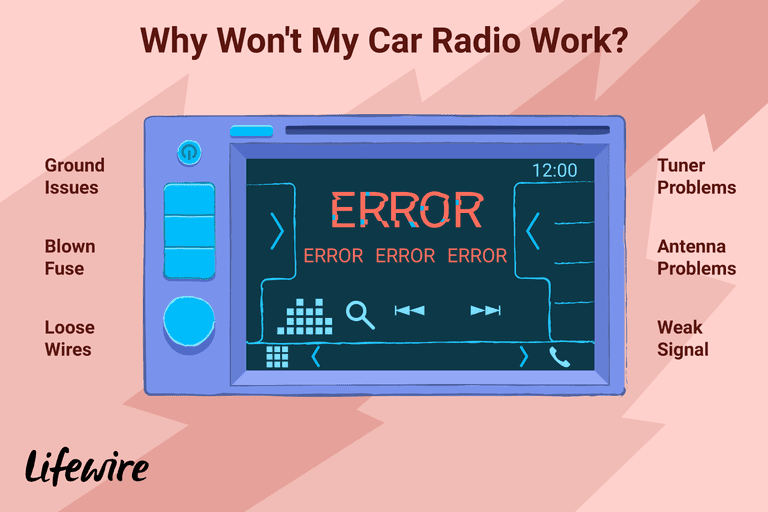 Check out our guide to diagnosing a car radio that only works sometimes for more information. If your radio turns on, but you don’t get any sound from the speakers, there are a whole lot of different potential culprits. The issue could be related to the amp if you have an external amp or the speaker wires. Depending on where your amp is located, it may be easy or quite difficult to check the amp. Some amps have in-line fuses while others are fused at the amp itself, and some installations have more than one fuse. If the amp fuse is blown, that is probably the reason that you aren't getting any sound out of your car radio. In some cases, a broken wire or bad connection in the speaker wires where they pass through into a door can also cut off the sound altogether rather than just cutting off the sound to one speaker. If you find that your sound comes back on if you open and shut the door, that may be the problem, or it could be a ground issue. If your radio doesn’t work, but you can listen to CDs, MP3 players, and other audio sources, then the problem is either related to the tuner or the antenna. You’ll probably have to buy a new head unit if the issue is in the tuner, but a lot of these problems are actually antenna issues. For instance, a loose or corroded antenna can cause poor reception or no reception at all. In that case, tightening the antenna connections or buying a new antenna will fix your car radio problem. If you've recently moved to a new area, or you're just trying to listen to one station that you can't receive any more, then an antenna booster may also fix the problem. This isn't going to be the fix you're looking for if the radio doesn't work at all, but if you're just having a problem with weak signals, then it may do the trick. Another surprisingly common car antenna issue has to do with manually retractable whips. If your car has one of these, and you haven’t already checked it, then you’ll want to verify that nobody retracted it when you weren’t looking. If a car wash attendant pushed it in to be helpful, or a prankster shoved it in while your car was parked somewhere, you could very easily climb back in, turn on the radio, and find that it won’t work at all. Some cars are able to receive some stations, depending on proximity and signal strength, with the whip retracted, while others can’t tune in anything at all.